Director 11.5 running on Windows 7. 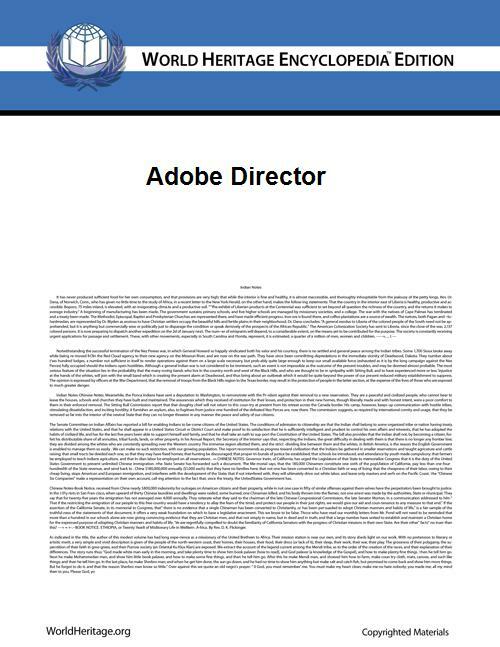 Adobe Director (formerly Macromedia Director) is a multimedia application authoring platform created by Macromedia—now part of Adobe Systems. It allows users to build applications built on a movie metaphor, with the user as the "director" of the movie. Originally designed for creating animation sequences, the addition of a scripting language called Lingo made it a popular choice for creating CD-ROMs and standalone kiosks and web content using Adobe Shockwave. Adobe Director supports both 2D and 3D multimedia projects. Director has a powerful scripting language called Lingo, which allows interaction with external files and certain Windows APIs that has been used to mockup graphical user interfaces, create prototypes of applications, as well as create self-running kiosks to run off a hard drive, CDs and DVDs. It has also been used to author interactive games with rich graphics and video. Director supports many different image, audio, and video formats. Built into the language are a suite of very powerful 2D image manipulation tools, referred to as "imaging Lingo". This subset of Lingo allows authors to perform advanced operations such as to bitblit. While a vast majority of users rely on the score timeline for the development of their work, a number of expert developers create stunning projects, such as games, that take advantage of the speed of imaging Lingo. These advanced projects typically use only 1 frame on the score timeline using Lingo to control animation and interaction. Director 8.5 added the ability to import, manipulate, and display 3D objects. The 3D features were quite advanced for the time, unusual for an authoring environment. The 3D capability includes the ability to create geometry on the fly from code, hardware accelerated model display, and advanced lighting features. It also supports vector graphics and 3D interactivity through a Shockwave 3D file object. 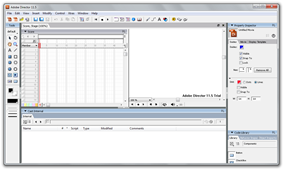 Since Version 6, Director has supported the import of Flash animation files and Lingo can be used to interact with Flash's Actionscript code for more control. One of the most powerful aspects of Director is its extensibility, which is achieved through plug-in applications named Xtras. For example, there are Xtras for OS desktop manipulations (creating folders, files, icons, shortcuts, registry editing) and Shell control, dedicated text processing (RegX), PDF readers, and many more. With Xtras, Director can be extended to support additional media types beyond those that the stock version of the software allows. These can be created by users or purchased from third party vendors. They are created using Adobe Director's XDK (Xtra Development Kit), a C++ SDK. With the change in new versions of Director, Xtra developers need to modify their products to maintain ongoing support. With changing industry trends, many third-party Xtra developers have discontinued products and dropped support due the cost of development without the significant return. For online distribution, Director can publish projects for embedding in websites using the Shockwave plugin. Shockwave files have a .DCR file extension. Other publishing options include stand-alone executable file called projectors, supported on Macintosh and Windows operating systems, and with Director 12, output for iOS. The Director score timeline can also be exported as a non-interactive video formats, such as a QuickTime or sequence of images. The differences between Director and Flash have been the subject of much discussion, especially in the Director development community. Extensibility is one of the main differences between the two, as are some of the sundry codecs that can be imported. Director has tended to be the larger of the two, but that footprint has been part of its weakness. This weakness manifested into the erosion of Director's ubiquity as the leader of authoring tools, especially in the critical window of 1998 - 2000. The download footprint of the Director Shockwave plugin was significantly larger than the Shockwave Flash download footprint. Additionally, Macromedia partnered with distributors such as Dell, Apple, etc. to have the Flash plugin pre-installed on machines for users, so that they would not be prompted to install any additional software. At that point in time (1998–2000), broadband internet access was not the norm for most users, and the fivefold difference in size was significant. Director started out as MacroMind "VideoWorks", an application for the original Apple Macintosh. Animations were initially limited to the black and white of early Macintosh screens. The name was changed to "Director" in 1987, with the addition of new capabilities and the Lingo scripting language in 1988. A Windows version was available in the early 1990s. From 1995 to 1997 a competing multimedia authoring program appeared called mTropolis (from mFactory). In 1997 mTropolis was purchased and buried by Quark, Inc., who had its own plans into multimedia authoring with Quark Immedia. The first Director release under the Adobe brand (v. 11), released after a gap of four years, featured DirectX 9 and Unicode support and extended 3D capabilities based on the NVIDIA PhysX engine, as well as bitmap filters, enhanced video, audio and image file formats support, and Adobe Flash CS3 integration. Shockwave Player 11 was also released.